just too dang cute!!! great job! I love it! Just a typical Florida scene, what I'm living right now. Great moment and greatly photographed. I think the turtle is showing off, and the gator is thinking "why don't you just get lost"... he he. So funny!! Really great shot! Nice shot! The turtle is 'planking' ... really popular with the kids these days. This is such an awesome shot! What the hell was that turtle thinking???? Looks like he's telling a grrrrreat story, a story from one cold-blood to another. 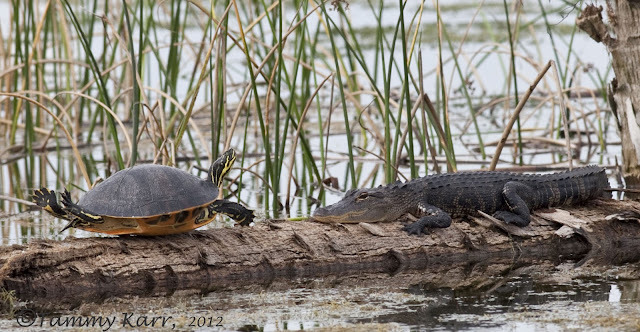 Beautiful photo Tammy, the turtle seems to be dancing but rather by fear. Greetings from Extremadura. Amazing shot Tammy, nice and original picture! Oh my stars! That is one brave (?) turtle! Terrific capture Tammy! Oh Tammy, what a brilliant photography. Nice one Tammy, great to be in the right place at the right time and capture it so well!! That is quite a picture! I also wonder what thought could have triggered that reaction from the turtle! I agree with you: that photo deserved to be alone in your post! Excellent photograph! Very, very interesting and love the expressions of both animals. LOL!!! What a great shot! Looks like a swan dive practice. The gator doesn't look too impressed though. Guauuu!! curiosísima foto. Espero que la pobre tortuga pudiese escapar. Hilarious!!! This shot definitely deserves its own post. Just amazing ! hopefully they co exsisting. That is hysterical. I love it! funny, but I didnt understand if the turtle is in danger.. I love this awesome photo.. your the best at capturing the actions of the wildlife around you, Tammy.